Every day feels like a holiday ! Yes that’s how my family and I feel since we moved from Scotland to Wellington, New Zealand in October last year. We finally had our dream come true. We are, Heather, Duncan, Lee (23) and Kelly (18) Spence. 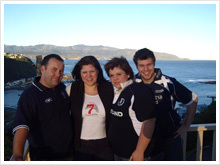 After many years of thinking about moving to New Zealand, our journey started after I applied to Tonix via their website. To my amazement I received a telephone call within 24 hours of submitting my application. Annie talked with me for over an hour on my nursing experience, what I was looking for, where in New Zealand had I thought of settling and offered suggestions of jobs etc for the rest of my family. Annie guided me expertly through the Nursing council application, what I had to do for immigration application and most importantly She made an outstanding effort to match my specialty skill with a job in New Zealand. Throughout the whole process Annie was supportive, encouraging and She continuously showed her professionalism, keeping in contact regularly by e-mail and telephone. We were invited to a Tonix reunion a few months after we arrived, to meet other families that had moved to New Zealand just like us, and also to meet members of the Tonix team. In our opinion ALL STAFF at Tonix Health Recruitment are helpful, caring and fantastic people to have help you through the maze of immigration. All the family have jobs, I have even got promotion. None of us have any regrets moving to New Zealand. Thank you Annie, Thank you Tonix.